More people are electing to undergo total knee replacement than ever before. These patients are much younger than they had been in past, when total knee replacement surgery was typically reserved for elderly people with severe arthritis and those who suffered a traumatic knee injury. According to a recent news feature form Blabbermouth, Glenn Hughes, who is the former base player and vocalist for the band, Deep Purple, has recently cancelled his upcoming U.S. tour which has been marketed at The Trek. Hughes is unable to make The Trek because he says he suffered some “recent setbacks” following his double knee replacement surgery. Since he obviously planned his tour dates a while, he elected to have the double knee replacement procedure believing he would be ready for tour’s first date in San Jose, California by March 2, 2016. Hughes, who is better known as the “Voice of Rock” will be inducted into the Rock and Roll Hall of Fame later this year, as well. He said that due to his setback, he could not provide the fans with the experience they deserve and said it will be worth the wait. First, we would like to wish Hughes a safe and complete recovery from his recent complications related to his double knee replacement surgery. It should be noted that double knee replacement, called a bilateral knee replacement in the medical community, is a somewhat controversial procedure. While there is no question that only putting a patient under anesthesia and having to undergo a single recovery has some definite advantages. 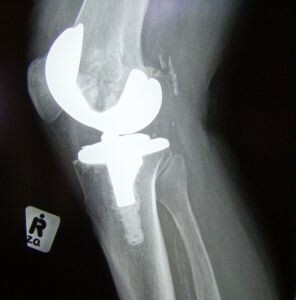 However, some doctors are unwilling to perform a bilateral total knee replacement, because it can be very default for a patient to recover as quickly. The danger is that the faster a patient can get out of bed, the safer it is for the patient, because the longer he or she lies down after surgery, the higher chance there will be for a patient to develop blood clots in the legs known as a deep vein thrombosis (DVT). DVT clot can travel through the patient’s circulatory system and cause serious injury or death. All of these complications are possible, even if the surgeon does everything perfectly and the knee is working properly. However, if the patient had a defective Stryker knee implanted, there is a very high chance he or she will suffer a device failure that will result in serous pain and suffering and could require a subsequent or even third knee replacement surgery. If you have had a total knee replacement surgery, and the device has failed, or you were told you need another knee surgery to correct a defect, you should contact a Boston knee replacement injury attorney as soon as possible. Even if your insurance is going to cover the second surgery, or the medical device company agrees to provide a replacement, you should be entitled to compensation for any pain and suffering caused by a defectively designed knee. You should also be compensated for any lost wages when you have to take off time from work for a second surgery and recovery period.